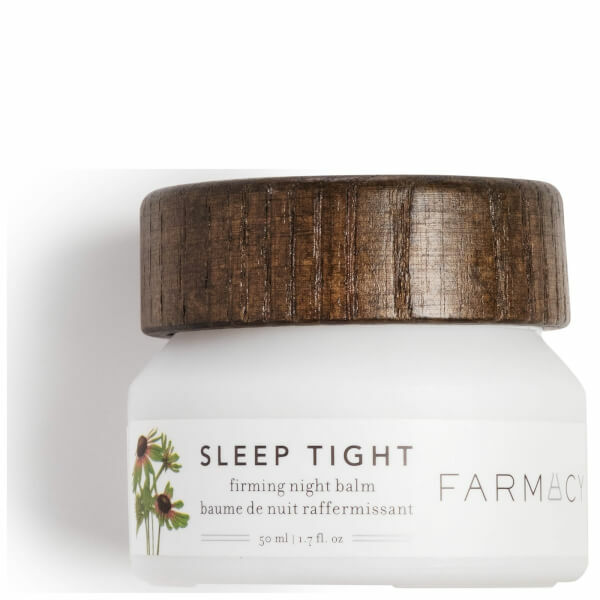 Wake up to radiant skin with the Farmacy Sleep Tight Firming Night Balm, an intensive treatment that turns back the clock as you sleep. The weightless balm transforms into a luxurious oil-gel that sinks into skin, helping to replenish high levels of moisture in order to plump out premature fine lines and wrinkles. South African Acmella Plant extract stimulates the natural production of collagen for a firmer, more lifted facial contour, while Vitamin C provides antioxidant protection and balances the skin tone. 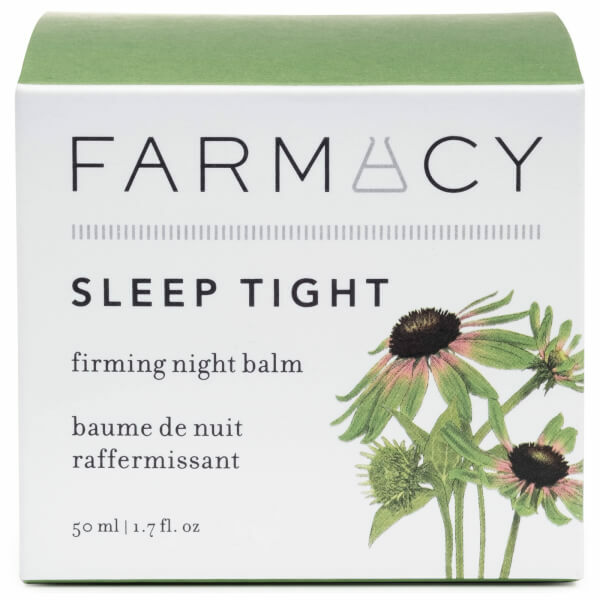 Upon waking, skin appears smooth, refined and infused with a youthful glow. Free from parabens, phthalates and synthetic fragrances. Not tested on animals. Usar por la noche sobre la piel limpia. Calentar una pequeña cantidad entre las palmas y aplicar suavemente sobre la piel. Extender con movimientos ascendentes y exteriores. Prunus Amygdalus Dulcis (Sweet Almond) Oil, Coco-Caprylate, Dextrin Palmitate, Helianthus Annuus (Sunflower) Seed Oil, Sorbitan Sesquioleate, Caprylic/Capric Triglyceride, Limnanthes Alba (Meadowfoam) Seed Oil, Oenothera Biennis (Evening Primrose) Oil, Oryza Sativa (Rice) Bran Oil, Simmondsia Chinensis Seed Oil, Vitis Vinifera (Grape) Seed Oil, Echinacea Purpurea Root Extract, Echinacea Purpurea Extract, Elaeis Guineensis (Palm) Oil, Gossypium Herbaceum (Cotton) Seed Oil, Bidens Pilosa Extract, Linum Usitatissimum (Linseed) Seed Oil, Ribes Nigrum (Black Currant) Seed Oil, Spilanthes Acmella Flower Extract, Helianthus Annuus (Sunflower) Seed Oil Unsaponifiables, Cardiospermum Halicacabum Flower/Leaf/Vine Extract, Moringa Oleifera Seed Oil, Tetrahexyldecyl Ascorbate, Crambe Abyssinica Seed Oil, Tocopheryl Acetate, Ormenis Multicaulis Oil, Citrus Aurantium Dulcis (Orange) Peel Oil, Melia Azadirachta Leaf Extract, Tocopherol, Melia Azadirachta Flower Extract, Corallina Officinalis Extract, Citrus Aurantifolia (Lime) Oil, Citrus Aurantium Bergamia (Bergamot) Fruit Oil, Water/Aqua/Eau, Cananga Odorata Flower Oil, Amber Powder, Coccinia Indica Fruit Extract, Solanum Melongena (Eggplant) Fruit Extract, Curcuma Longa (Turmeric) Root Extract, Ocimum Sanctum Leaf Extract, Zingiber Officinale (Ginger) Root Oil, Rosmarinus Officinalis (Rosemary) Leaf Extract, Glycine Soja (Soybean) Oil, Silica Silylate, Octyldodecanol, Phenoxyethanol, Citral, Limonene, Linalool.